In February 1995 a small group of people with a common interest in saving the derelict Mechanics’ Institution building came together to form the Mechanics’ Action Group (MAG). Immediately they invited people to take up Founder membership in the Group. The response was electrifying. In the space of a few weeks over 1000 people had become members. The MAG sought advice from other heritage organisations such as the Association of Preservation Trusts (APT) and the Architectural Heritage Fund (AHF). They were advised to form themselves as the Building Preservation Trust and so “The New Mechanics’ Institution Preservation Trust Limited” was born. The Trust was registered as a company on the 23rd May 1995 and obtained Charity status on the 1st September 1995. 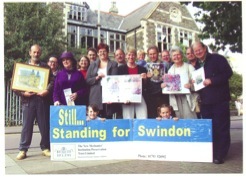 “To preserve whatever of the historical architectural and constructional heritage as may exist in and around the Borough of Swindon in the form of buildings including any building defined in Section 290(1) of the Town and Country Planning Act 1971 of particular beauty or historical architectural or constructional interest for the benefit of the Towns people of Swindon in the County of Wiltshire and of the Nation at large”. The initial aim of the Trust was to acquire the derelict Mechanics’ Institution building, restore it, and return it to operational use for the people of Swindon. One of the first steps taken by the newly founded trust was to organise a Feasibility Study. This carried out by members of the Trust with considerable input from four firms of consultants. The work was supported by a £7,500 grant from the AHF. The Feasibility Study commenced in January 1996 and the findings were published in October 1996. The study indicated that although the building was in a poor state it was not beyond restoration. Restoration costs however were high whist income generation from a restored building was moderate. From this the Trust reached the conclusion that the restoration of the building was not viable in the normal commercial economic sense, but was a suitable project for a Building Preservation Trust as “developers of last resort” and not requiring the same level of commercial return on investment. Public consultation during the course of the study had also revealed good support for uses that were compatible with the values of the original Institution. From this information and taking into account the economic viability the Trust was able to prepare outline sketches and proposals for the restoration, backed up by a draft financial plan. This was finally published in March 1998 as “A Plan to Operate the Restored Mechanics’ Institution”. Also during 1998 the Trust appointed the District Valuer to undertake an official valuation of the building. It was given a nominal value of £1. The valuation supported the Trust’s long-held position that the building had little or no commercial value. The Trust had always been concerned that the Grade 2 listing did not do full justice to the building. Considerable work into the history of the building had been carried out by local historian Trevor Cockbill, whose major work “Finest Thing Out” was published in 1988. A working relationship was established between Trevor and the Trust. In July 1996 Trevor delivered an address to Trust members on the history of the Mechanics’ Institution. This was subsequently published by the Trust in 1997 under the title “This is our Heritage”. The Trust actively lobbied regional and national organisations and as a result of the activities the building was considered for upgrading to Grade 2*. The Department for Culture, Media and Sport designated this new status on the 11th January 1999.